Today, I am making a batch of an old recipe of Tomato jam. Had it when I was a kid on the farm, and loved it, but mine seems really liquidy at the moment, hopefully once the raisins go in, it will solidify. I used Heritage tomatoes, the only ones we grow. Good year for tomatoes, except they are ripening late. Lots of rain, but not enough warm weather. The picture is from the Tomato Day that was held at Sisters of Providence, Seed Sanctuary on August 23, 2008. There were over 103 different types of Heritage tomatoes cut up for people to taste. This year we only grew out 15 varieties, but there are a few rogue plants in veg garden 4B. A project is to extent garden 4a and 4b by another 6 feet x 20 feet and build a strong fence of cedar posts up to 8 ft to keep the deer out. A new entrance way of cedar posts will be built, s o next year we can plant the scarlet runner beans that came from Sandi, Kevin’s mom. If anyone can tell me for sure. 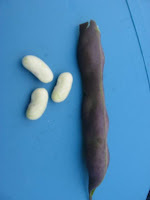 The pod is purple, and the beans a white/cream colour. Tomorrow we are going to the Garlic Festival in the morning and a wine tour in Prince Edward county, with dinner at the Warring House, a wonderful old stone house with gardens to die for. The rain is slowly falling today, and the plants are thankful, its been 12 days since no rain…..